Keith Curle intends to make best use of having a rare Saturday afternoon off by going a scouting mission with the rest of Cobblers’ management staff to view ‘potential targets, games and opposition’. 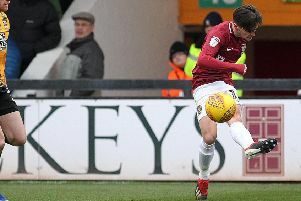 Northampton do not play this weekend following their first-round elimination in the FA Cup, beaten 3-2 at Lincoln City earlier in the month when Bruno Andrade scored a stoppage-time winner. I’ve learnt a lot over the years that sometimes you can dismantle a changing room 10 minutes after a game. There’s no need for me to go and do that. So while the majority of Town’s League Two rivals will be in action, Curle and his coaching staff have the opportunity to take a peak at upcoming opposition, or perhaps view potential targets for when the January transfer window opens. It’s also an opportunity for his players to take stock following their defeat at Newport County in midweek and ready themselves for a Checkatrade Trophy tie next Tuesday. “We’ll have a recovery day and the lads are in training on Thursday and Friday and then it’s an opportunity for the coaching staff and the recruitment staff to go out and view potential targets, games and opposition,” said the Cobblers boss. The extra few days of rest will also allow Curle to analyse his side’s defeat at Rodney Parade and work out what went wrong as the Cobblers look to bounce back ahead of the busy festive schedule. He added: “The beauty of football is that it’s a very emotive game and I’ve learnt a lot over the years that sometimes you can dismantle a changing room 10 minutes after a game. “There’s no need for me to go and do that. There are players that were hurting after Tuesday and you get the sad eyes, you get the head down and you don’t get the eye contact. “But losing a game means more to me than that. We’ll analyse the game and watch it back individually, making our notes and then look at is as a group before we speak to the players.